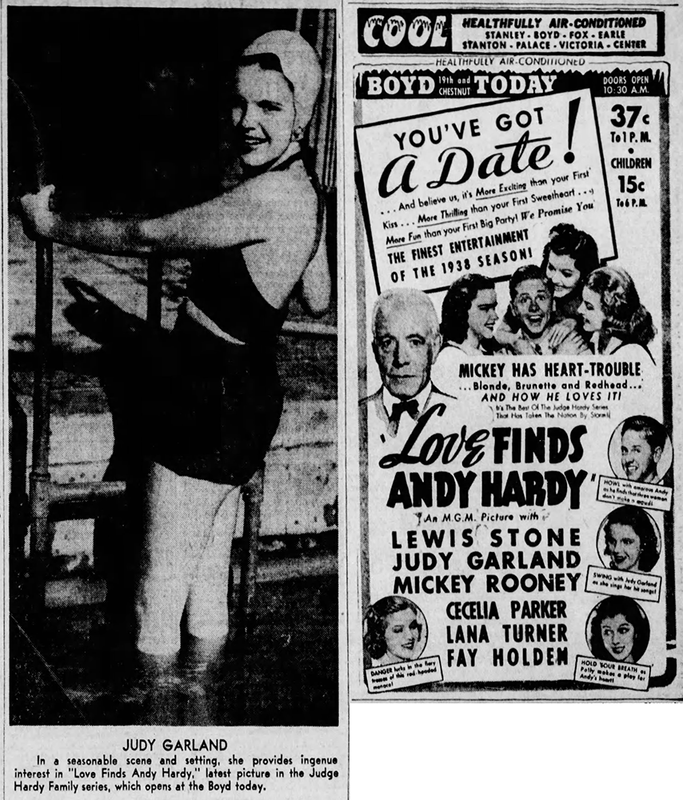 July 20, 1933: The first night of a week-long engagement for Judy, still going by her birth name Frances, at the Warner Brother Downtown Theater in Los Angeles, California. 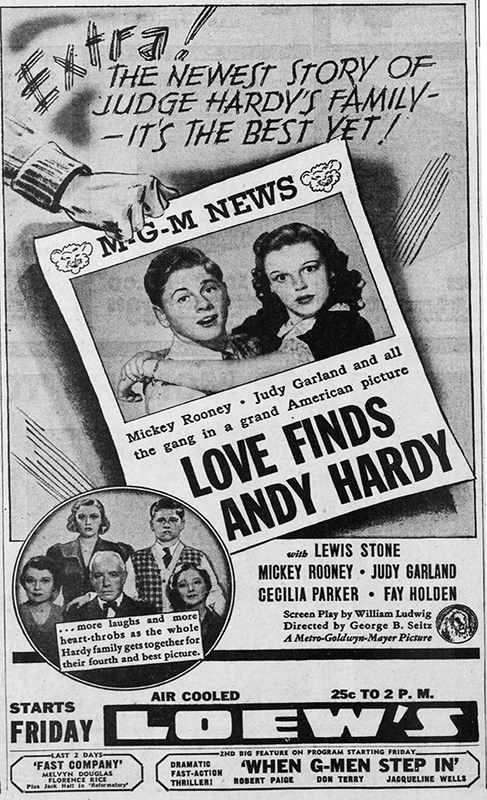 Judy is billed as “Frances Gum” (see the lower left side of the ad) with the tagline “A Wonder in Disguise” which probably reflects that fact that by this point Judy was wowing crowds with her very mature voice. In some shows, Judy sang with just a pin spot on her face. When she was finished the lights would come up, or the spot would open, to reveal to the audience that they had just listened to a child sing. It’s been reported that crowds went wild. It’s unclear why Judy was solo for this engagement rather than performing with her sisters as “The Gumm Sisters.” They were associated with the Meglin Kiddies who were also performing at this theater. July 20, 1934: This blurb appeared in the The Daily News Journal in Murfreesboro, Tennessee. Judy’s father, Frank Gumm, was from Murfreesboro and of course still had ties to the town. 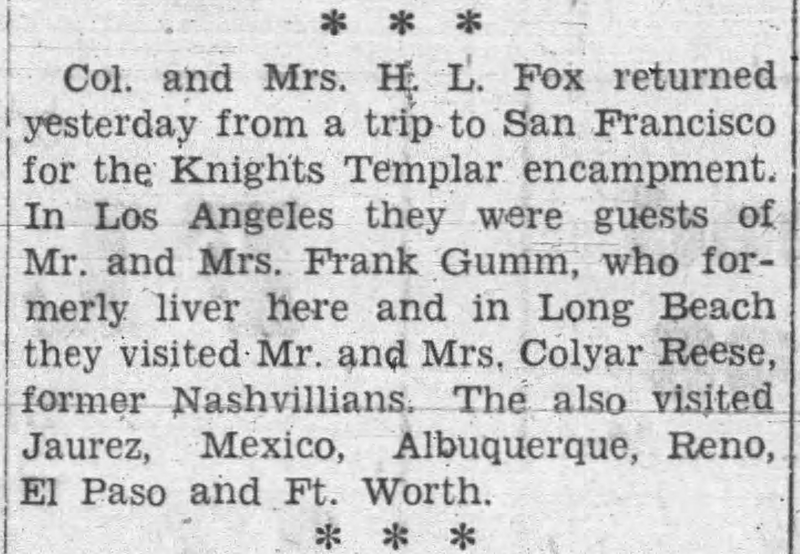 The visit with the Gumms that Colonel and Mr.s H. L. Fox had must have been in April or May of 1934. Judy, her sisters, and mother, Ethel, left California for their cross-country tour, the destination of which was the Chicago World’s Fair, in mid-June. When this blurb was published they were already in Chicago performing at the World’s Fair. 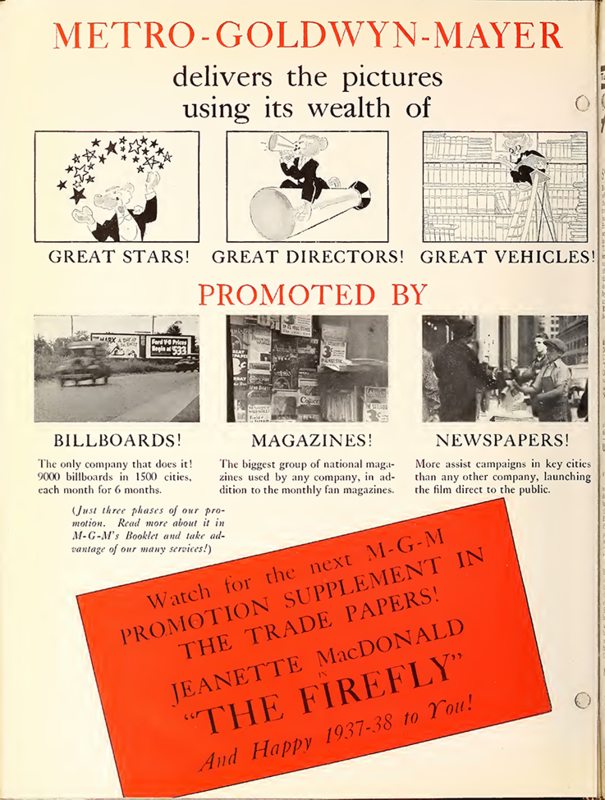 July 20, 1937: This four-page spread appeared in the Film Daily trade magazine promoting MGM’s latest films, including Judy’s feature film debut for the studio, Broadway Melody of 1938 (1937). 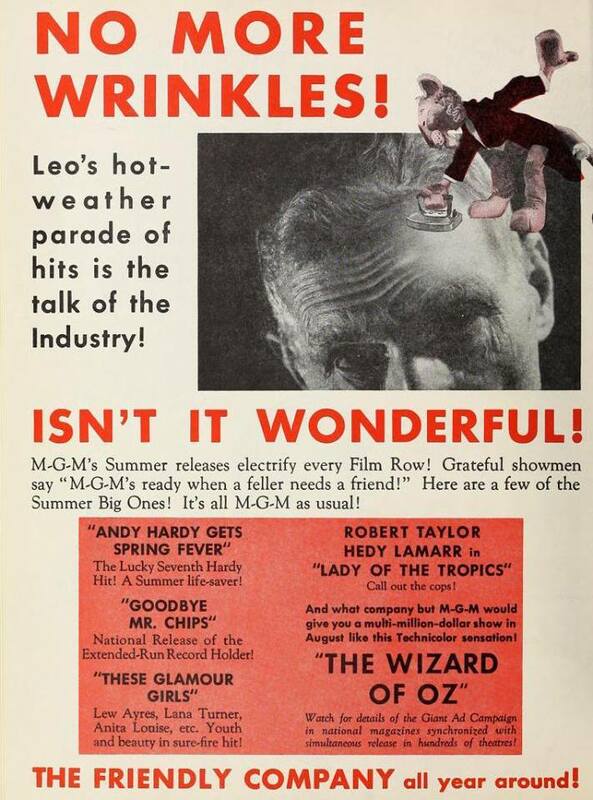 July 20, 1938: Coming to a theater near you! July 20, 1939: Film Daily trade magazine ad touting the upcoming release of The Wizard of Oz. July 20, 1941: Judy took a break from filming Babes on Broadway and was at the Decca Records studios in Hollywood. She recorded “The Birthday Of A King” and “The Star Of The East.” Both were released on the Decca single #4050 in December 1941. 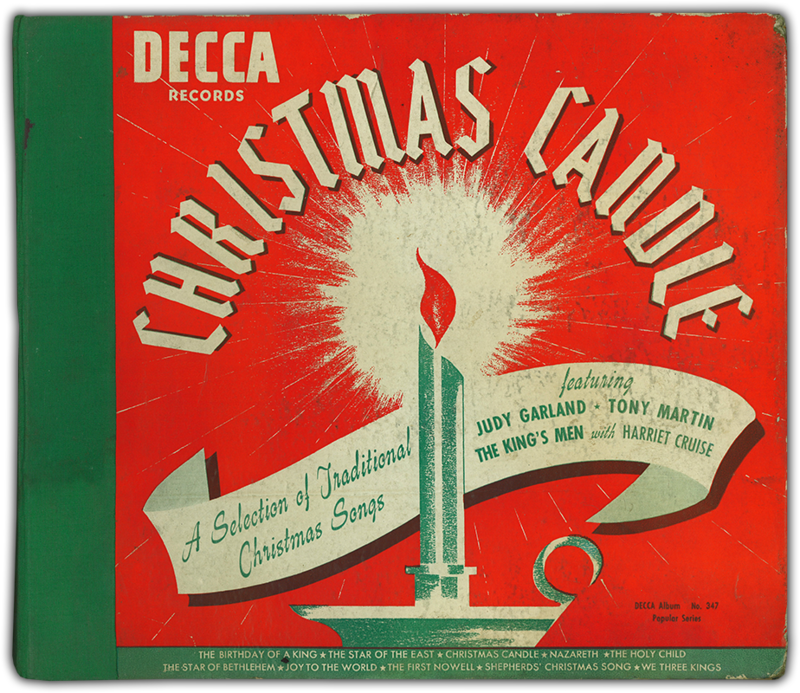 They were also included in the 1942 Decca album “Christmas Candle” (image seen above). 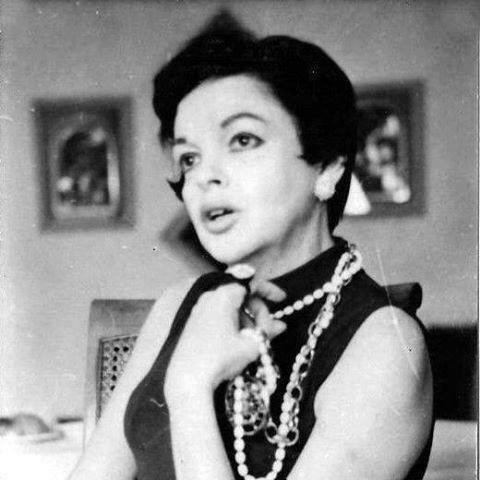 Check out The Judy Garland Online Discography’s Decca Records pages for more details about all of Judy’s Decca recordings. July 20, 1943: This photo was sent out by MGM’s publicity department to promote Judy and Mickey Rooney’s latest (and final) co-starring musical, Gershwin’s Girl Crazy (1943). 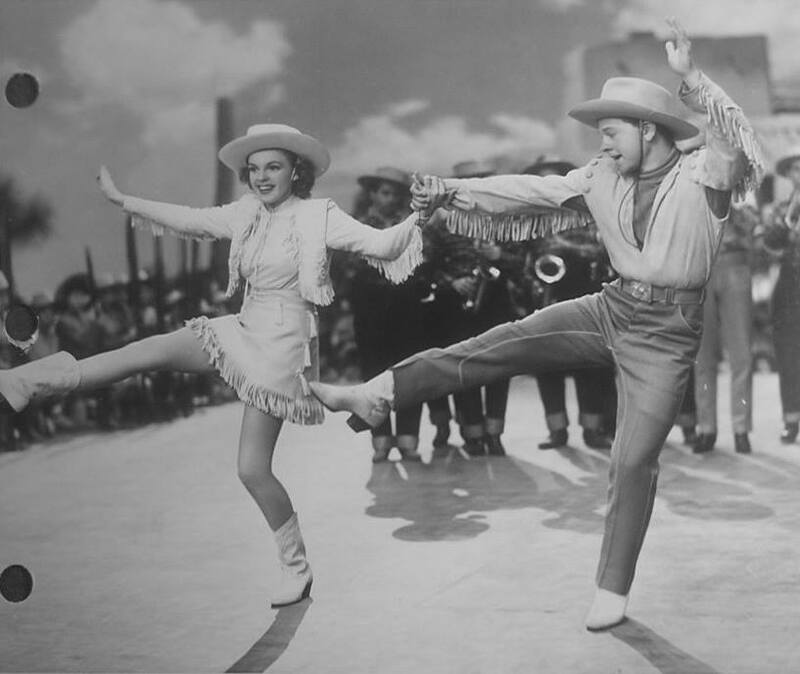 The photo was taken during the filming of the “I Got Rhythm” number in late 1942. THEY’VE GOT RHYTHM…Mickey Rooney and Judy Garland sing and dance to the music of Tommy Dorsey and his orchestra, playing the famous George Gershwin hit, “I’ve Got Rhythm,” in Metro-Goldwyn-Mayer’s “Girl Crazy” Others featured in the film directed by Norman Taurog and produced by Arthur Freed, are Nancy Walker, Rags Ragland and Frances Rafferty. 2. Mickey and Judy high-kick while Tommy Dorsey Plays trombone in the background. Judy sang along to the MGM orchestra-only track that Lena was supposed to sing with. It’s a “lost” Judy Garland MGM recording. 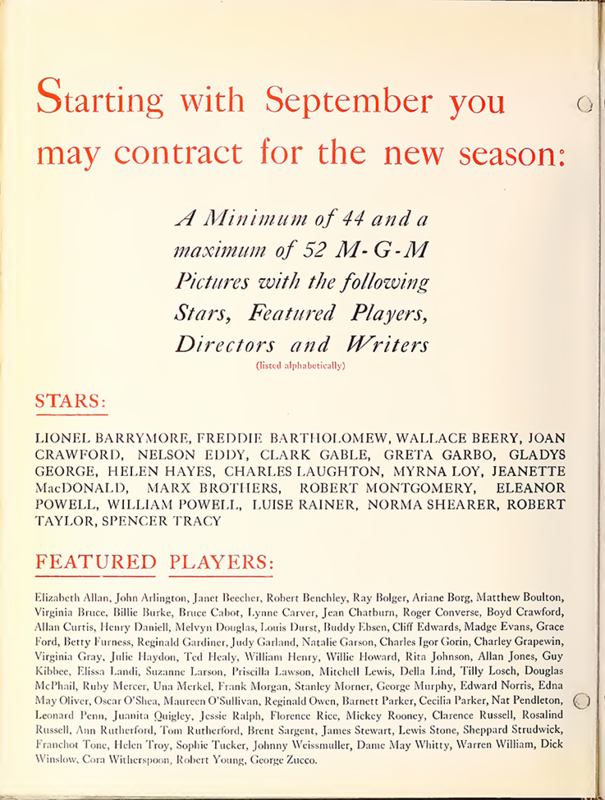 In February of 1946, the Hollywood Bowl Association approached MGM producer Arthur Freed to produce a Kern memorial concert for their summer season. Freed accepted. At the time of the request, the studio was finishing up production of their all-star biopic about Kern titled Till The Clouds Roll By. 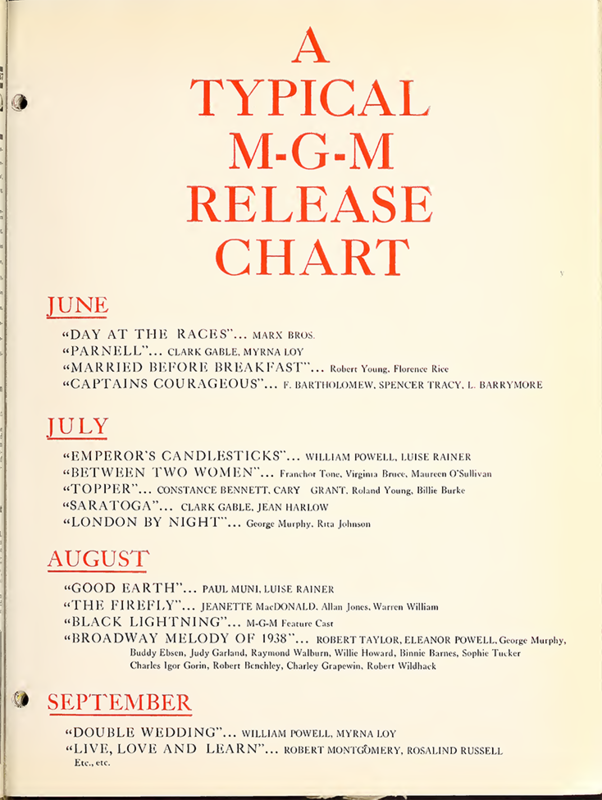 The film previewed on July 2, 1946, so the timing of the concert gave MGM some great promotion, even though the film didn’t go into general release until January 3, 1947. 1) The California Junior Symphony Orchestra conducted by Peter Meremblum played a medley of Kern songs. 2) Johnny Green conducted the Hollywood Bowl Orchestra with some of the stars from the film recreating their numbers (including Judy singing “Look For The Silver Lining” and “Who?”) followed by Green and the orchestra performing the “Mark Twain Suite” (a Kern eulogy written by Freed himself). 3) The extensive “Finale Medley” from the film. This is the section of the broadcast that MGM cleverly used their orchestra-only pre-recordings for the stars to sing with. 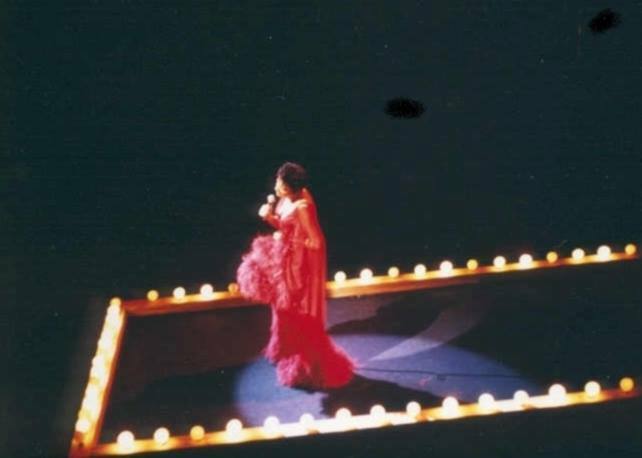 Twenty minutes after the concert had started, word came that Lena Horne would not be able to appear. Since they were using the MGM pre-recordings for the finale section, which included Lena’s “Why Was I Born?” solo, her section couldn’t be cut at such short notice. At intermission, MGM’s musical director Roger Edens went to Judy’s dressing room and persuaded her to step in for Lena. They quickly rehearsed the song at a “small, broken down piano” in a “passageway leading to the dressing rooms backstage.” Judy came through with a beautiful performance. Because of this last minute change, and the fact that the broadcast was recorded, we’re treated to a unique MGM recording of Judy Garland singing “Why Was I Born?” Yes, an MGM recording. It’s Judy singing with the studio pre-recording of the MGM Studio Orchestra just as she would have if she were recording the song for the film at MGM. That’s not as crazy as it sounds. MGM pre-recorded their music in a multi-track system on separate audio optical tracks, a process dating back at the studio to about 1931. This was done to create perfect takes and a balanced mono track for the films. Many of the recordings you hear in their films are culled together from multiple vocal and orchestra takes. The only public release of this performance was on a 1970s record “The Judy Garland Musical Scrapbook” without any explanation of its history. Over the years, collectors have wondered if this was a rare, unreleased and possibly undocumented pre-recording that Judy made for the studio. Maybe she was even slated to sing it in the film? As nice as it would be to think that this is a rare test record Judy made at the studio, it’s not. Judy completed her work on Clouds on November 7, 1945. Already pregnant with Liza, Judy was off work for the rest of her pregnancy and shortly thereafter. 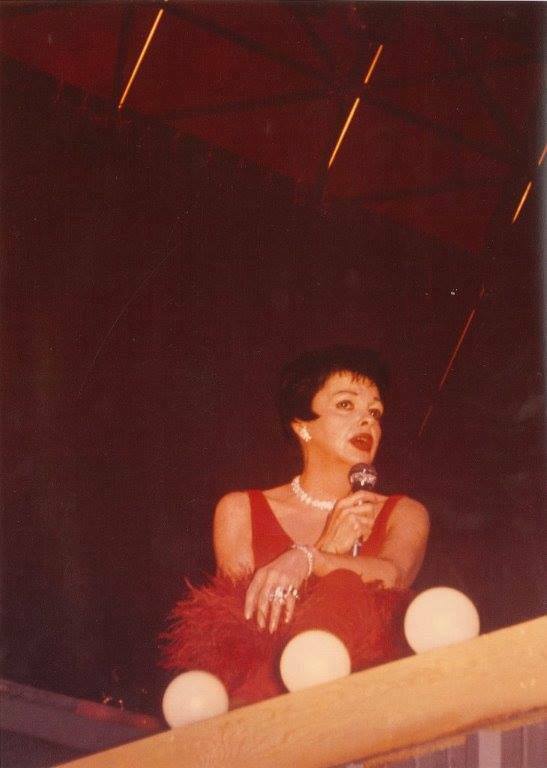 In fact, this broadcast is one of Judy’s first public appearances after Liza’s birth. Lena recorded her numbers for the film in January, March, and April of 1946. It makes no sense for MGM to call Judy in to record a vocal to marry to the orchestra track of a Lena recording from March 22, 1946. Besides, Judy was never slated to sing it in the film. It was always planned as Lena’s solo in the film’s “Finale Medley” section. In the end, thanks to this concert being recorded we have this “lost” Judy Garland MGM recording. 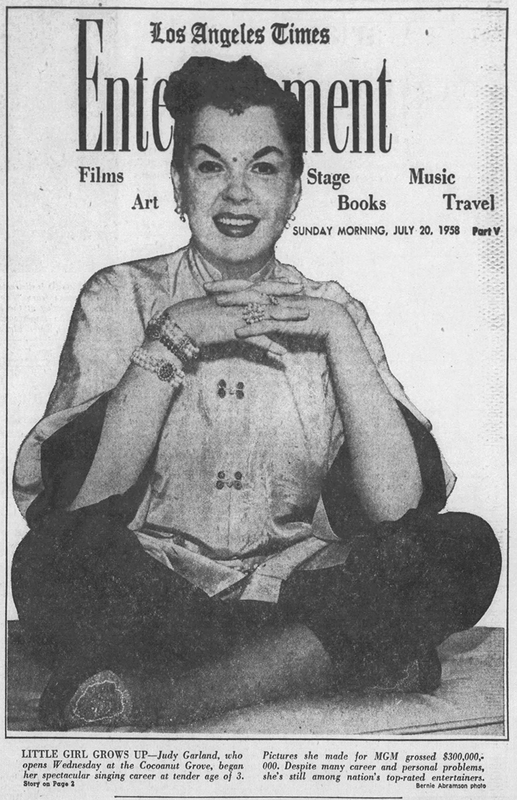 July 20, 1958: Judy’s upcoming concert at The Coconut Grove (July 23rd) was news. 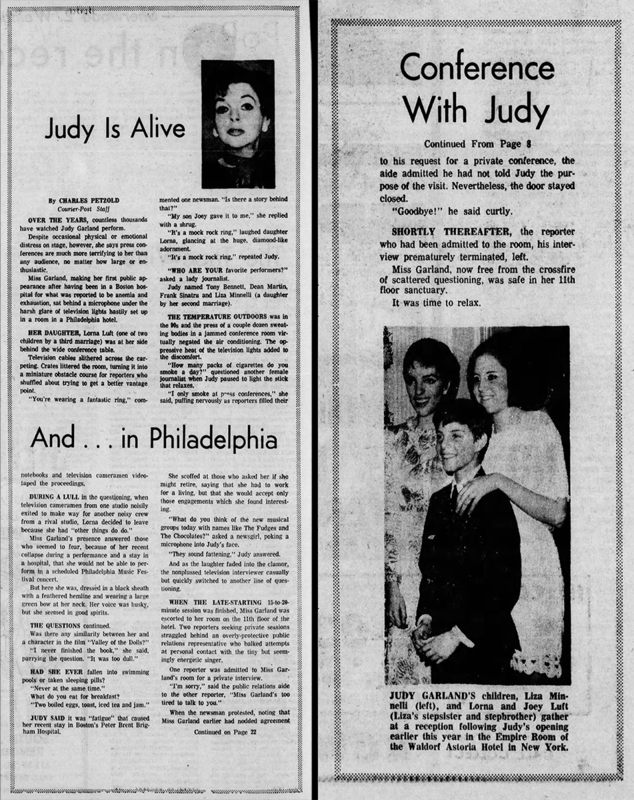 Here’s an article about how Judy’s grown up (again) published by the Los Angeles Times. Click on the image to read the article. July 20, 1961: Judy attended a party held onstage at Carnegie Hall that Capitol Records gave to celebrate the release of the “Judy at Carnegie Hall” album. 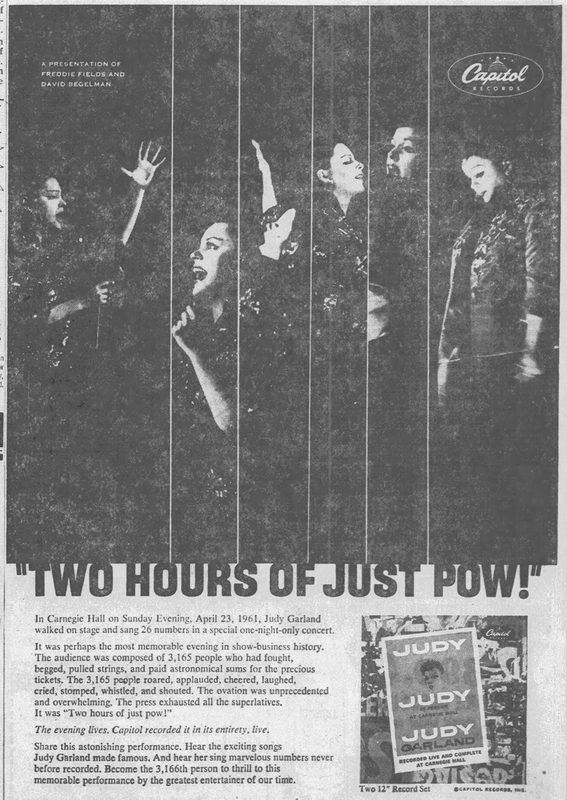 “Melody Maker” had the following to say, which gives an indication of the huge success and response to the album, and why practically every household in the U.S. had a copy, even if they weren’t “Garland fans”: I finally got around to getting myself the new Judy Garland album. The concert took place on April 23rd of this year, and from those who were there, I gathered that this was a great night. I’ve always been a Judy Garland fan without getting to the fever stage, but brother, I am converted now. The album consists of two LPs without any inhibitions whatsoever. Let me confess I’ve never sat through such recorded emotion in my life. 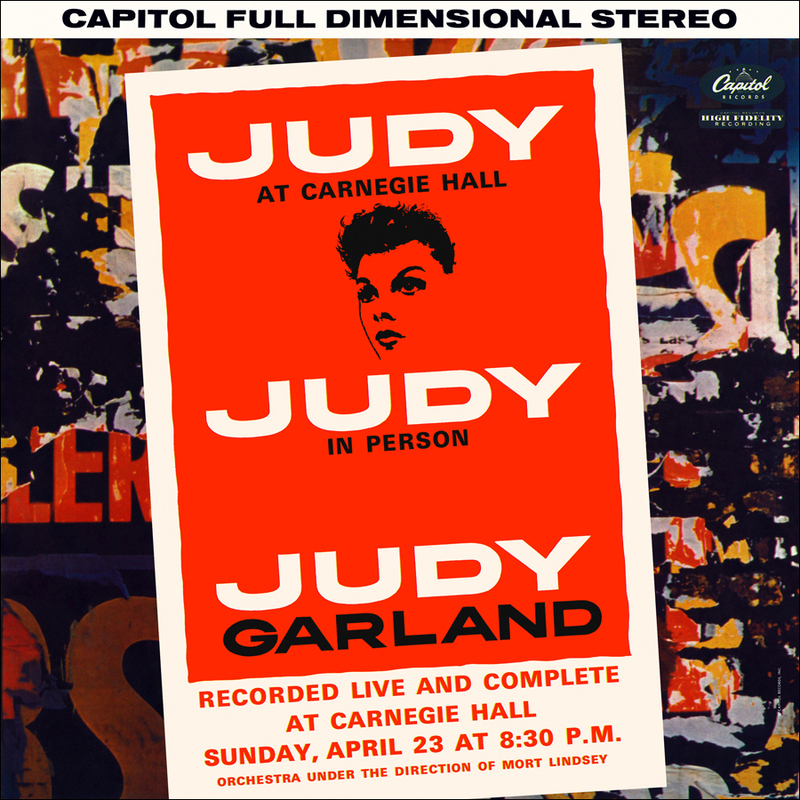 Check out The Judy Garland Online Discography’s “Judy at Carnegie Hall” pages for details about all of the releases of the album. July 20, 1968: Judy’s last concert in the U.S. She appeared at the J.F.K. Stadium in Philadelphia, Pennsylvania. Over 20,000 people were in attendance. 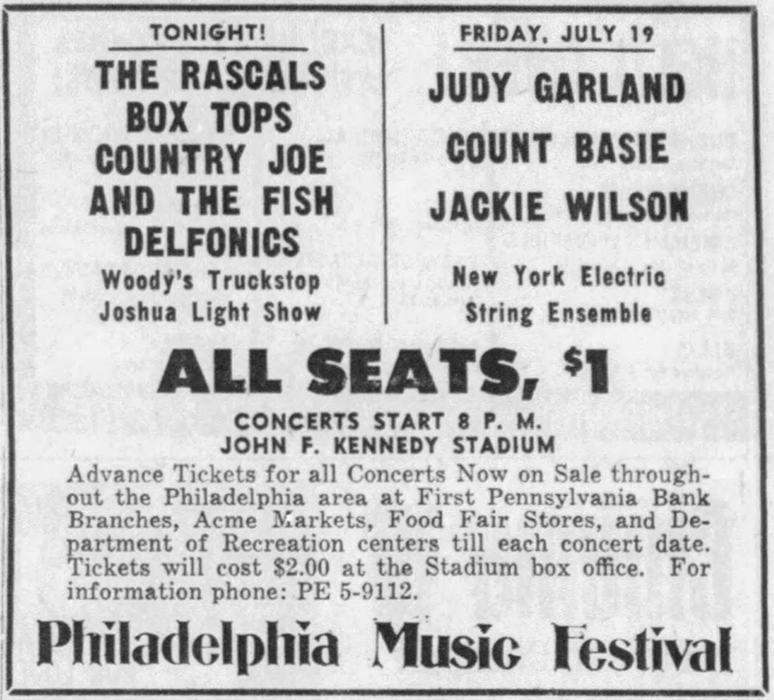 Ironically, Philadelphia was also the location of Judy’s first real concert in July 1943. I want to salute Scott Brogan in his efforts to produce a daily diary for this website. All is fascinating reading, and he deserves credit for this herculean task. Thanks, Scott. Hi, thanks for that stereo remix of Judy AND Lena’s “Why Was I Born?” Absolutely gorgeous. 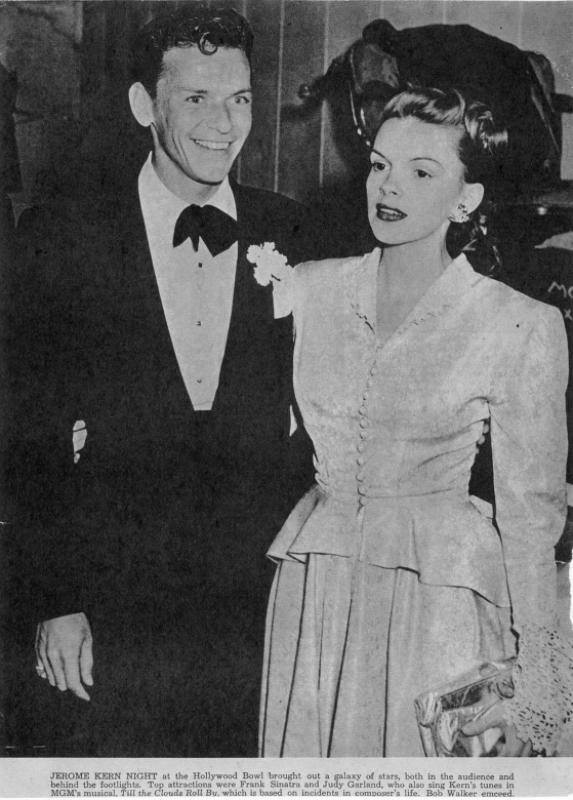 Judy also sang “The Right Romance” that night, and I consider it one of the most beautiful recordings of her life. It’s remastered and included in the four-CD radio box set. Thanks, too, for the two tracks from Judy’s very last U.S. concert. Just thrilling to hear her give so much to the audience, even in the end. Hi, I can only agree wholeheartedly with Larry. Thanks so much for all that you do for us Scott. One small correction though to Gary Bennett. ‘The Right Romance’ is indeed from The Hollywood Bowl. 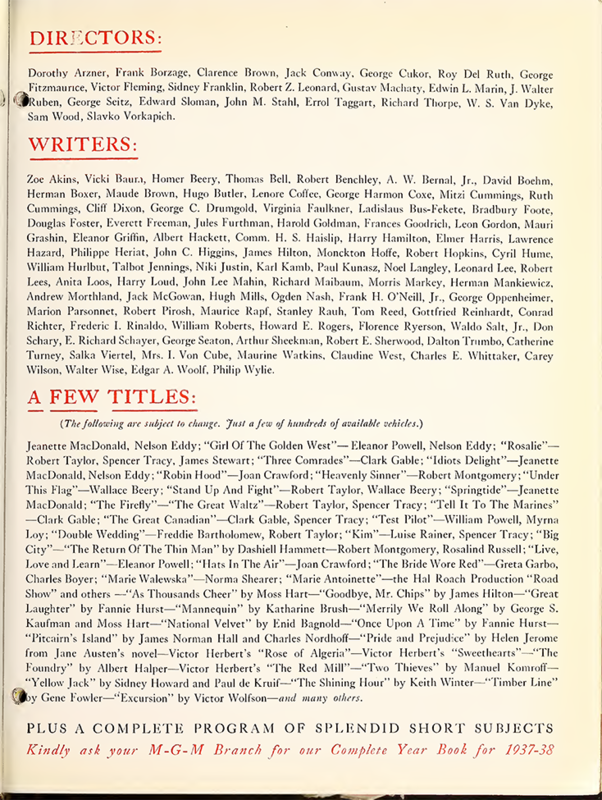 And it was also written by Jerome Kern. From his last score by the way. ‘Motion Picture Academy Night At The Hollywood Bowl’. Orchestra conducted by Alfred Newman. Gene sings ‘In Love In Vain’, then Judy sings ‘The Right Romance’, then Gen sings ‘Railroad Song’ and then they duet with ‘All Through The Day’.